Questions will be answered. Trust will be rebuilt. And the true threat to the world will be revealed. The threat to the Four Horsemen and the world continues, but now they have solid leads and are closer to uncovering who is behind the attacks. Vee and the Four become closer as barriers fall and trust grows, yet one person remains worried about what will happen if Vee reaches full power. An opportunity to regain Portia's trust, some help from a supernatural mercenary, and an investigation into the Myriad Foundation reveal more answers about the chaos surrounding them. Suddenly, everything slots into place but the big picture isn't what they expected. What will happen if the only way forward for the Horsemen is an alliance with their enemies? 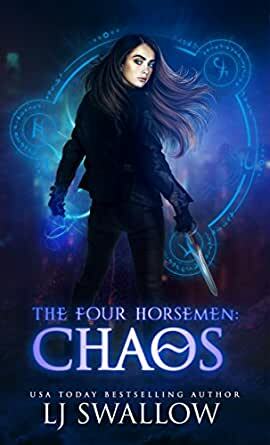 The Four Horsemen: Chaos is book five in the series. The other books in this series must be read first. Don't miss out on reading this year's hottest reverse harem urban fantasy series. Prepare to follow the lives of Vee and the Four Horsemen through addictive books filled with action, paranormal suspense and magic. Start the series with Legacy and discover why readers have fallen in love with the books--and the Horsemen! The series contains strong language, steamy scenes, a kickass heroine and four guys who'll do anything for the girl who's the centre of their world. 5.0 out of 5 starsWhat Just Happened? Right well, this series just took a serious swerve into WTFville. Did I still enjoy it? Yes. Would I still recommend it to readers of romance, especially polyandry? Absolutely. Am I going to stop reading? Hell no. But we did take a massive sideways leap with little explanation. I did have problems with parts of the writing. Some parts felt a bit like lazy writing. Word for word lines from the previous books are used again but that may be a conscious decision given the relationship of the characters involved. This book is a mind spin in context. So many changes may be too much. I question how it was done were there warning markers? My Goodreads review is longer but gets spoliery fast. 5.0 out of 5 starsHighly captivating and intriguing RH series!! This is the fifth book in this series by Lisa Swallow and like all the previous books it captures the attention of the reader from the first page and keeps your attention to the very last page!! I could not wait to read this book as book 4 finished on a cliffhanger and now cannot wait for the next book so that I can see what happens next! there were times while reading this book that I just wanted to hit the guys over the head for not understanding Vee a bit more, especially Ewan!! I love Vee’s connection with Xander even if he does not want to admit to his feelings, he has to be my favourite out of the all! Once again another fantastic book in this series and I cannot wait to read more! This book is much shorter than the others in the series, and really doesn’t add much to the overall story except at the very end. There were also quite a lot of typos and mistakes, needs another round of proof reads. I knew it Seth being Chaos, and I am glad Ewan finally opened up and got closer to Vee now I know they can defeat Chaos aka Seth. I devour this book it's so delicious. 5.0 out of 5 starsThe enemy of my enemy is my friend - Twists within twists for our Horsemen. It was hard to wait for this book, the fifth in The Four Horsemen series, and LJ Swallow did not disappoint, but then, for me, she never has. Picking up from the particularly shocking end in Guardians, Chaos carries the momentum well as various theories are getting thrown around as to who it is wanting to take the Horsemen out, and bring about the opening of The Portals. And whoever it is just might be attaining their goals a little quicker than The Five realise. It’s a race to ask the right questions, find the answers, form the right allegiances, and, those whom they thought were enemies, suddenly become unlikely allies. When someone they’ve spent time trying to eradicate in the past suddenly shows up wanting an allegiance with them, telling the boys, that without Vee at her most powerful, they are all in trouble, then, they really are all in trouble! I’m reminded of the saying, The enemy of my enemy, is my friend, and the craziest of alliances need to be formed, and promises made, to deal with a threat larger than them all - Chaos, he who predates all of them. He who scares them into a treatise previously unheard of. And, he who means that they are all relying on the Fifth to have reached her full capacity, and without whom they will surely perish. Players are starting to reveal their hands, and the momentum is really picking up in this book. At the end, I was completely chomping at the bit to find out what happens in the next two instalments which means, that scoring this book anything less than 5 Stars is blasphemy! 5.0 out of 5 starsWHAT AN EPIC RIDE - WOW!!! Omg ... talk about a massive cliffhanger!!!! It’s becoming clear that Vee needs to secure all of her power and the only one standing in that path is Ewan and his reluctance to go further with her. This story moves along at a fast pace but it’s only until the end that the picture suddenly becomes a little clearer. This is one heck of a ride and just when you think you know who is involved - boom another massive twist!!! I don’t want to give it away but omg - Wow! LJ Swallow has really upped the ante with this instalment. You’re never ever really sure about who to trust and in this instalment you are left guessing .... right up until the very end. Then you know who definitely not to trust ! The only problem is what’s going to happen now? Chaos is what will ensue and they’re angry!!! LJ Swallow continues to hook you in and keep you guessing as to what is going to happen ... not just in this story but also for what’s to come next. I love how she always ups the ante .... just slowly enough that it keeps you wanting to know more and yet frustrates you because you have to wait to find out what will happen next lol. Her writing is just that good! I can’t wait to read the next instalment. It’s going to be one hell of a ride!